Took these pictures a couple weeks ago when it was pretty cold outside.. but evidently colder than I thought. 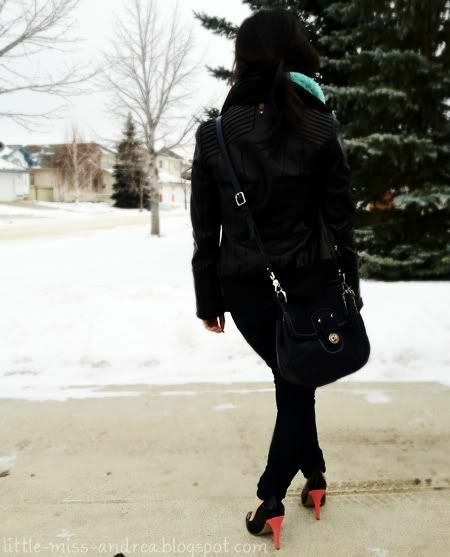 I remember after leaving my house, I could not stop shaking cause my measly leather jacket was not thick enough for the cold! The scarf totally didn't keep me warm either. Oops! Oh! And the bag I'm sporting up there is a newer one added to my collection, and you guessed it - another Coach bag. This one here is called the New Willis, as it is an updated version of their classic Willis bag. I love the deep navy colour, and the simplicity of it - and surprisingly enough it carries quite a bit! Didn't the groundhog see his shadow on groundhog day? I thought spring was around the corner.. guess not, since it started snowing here in Edmonton again today. Bundle up & stay warm, everyone! i love those heels!! the color is complementing your scarf perfectly. great look and love that scraf! That darn groundhog was a smarty pants! He was right! HAHA Andrea, you are too funny. You might've been cold, but you looked good girl. HAHA Love your Coach bag and fab heels girls. Wow, snowing? Yikes I can imagine that leather jacket not keeping you warm cuz I'm wearing one right now too and it's not evening snowing, lol. I love those jeans on you! They are very flattering and the fit is great. you are so pretty!! I lve the colorful accents like the scarf and the heels!! The bag is adorable!! I would probably wear it all the time.. 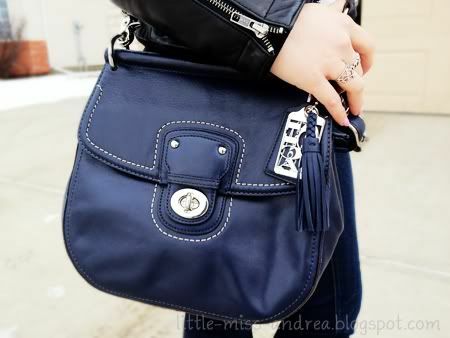 I have been revisiting Coach bags lately. I like the more classic looks similar to yours. It is a great color. I love the pop of mint green on your. OMG i love that scarf. seriously i love your scarf, and i love your bag too! Followed you! LOve your scarf it fits on you! You might have been freezing but at least you looked cute! Ah, Canadian weather.. always so unpredictable! I gotta say - ur like sunshine in this cold with that outfit! Fab heels and bag too. You have wonderful style! Ah! A fellow Canadian! 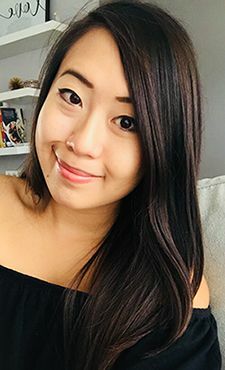 I blog from Ontario =). You have a wonderful blog and lovely style, and I've followed you! Hope you decide to follow me back! Love the shoes! Thanks for your comment, of course I'm following back!! love the splash of color that your scarf adds!! 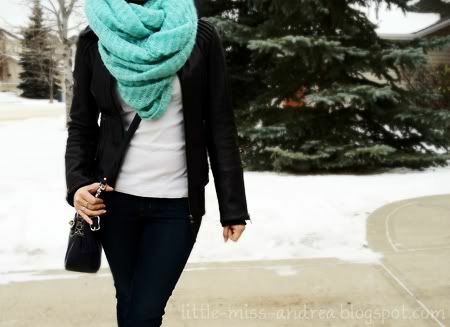 Love the mint scarf! Thank you for followeing my blog,followed back:-) M.
pretty cold- I was cold today and there was no snow in sight.. so can't imagine how you're feeling! Dearest Andrea, I love that scarf ALMOST as much as I love you and your blog. i heart you so much!! 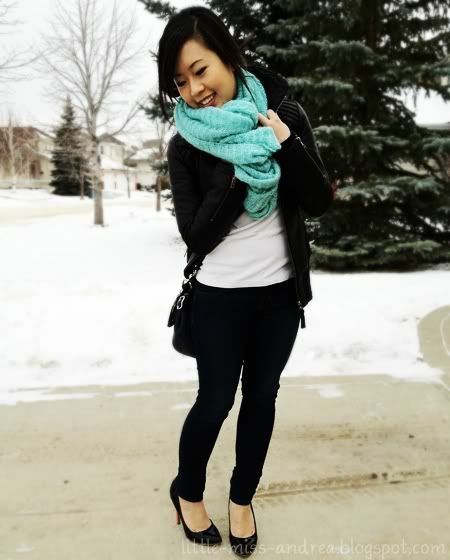 you look so pretty :) i love this outfit on you that scarf is such a great pop of color.. i love your mackage jacket!! i realize everyone from canada LOVES mackage hahah.. i only just recently discovered them but they are SOO chic!